Summer is here, and my last post was around New Year's. I have a bunch of really good excuses for having gone 6 months without a blog post. The best excuse is moving my home from Phoenix to Coronado. The second best excuse is moving my blog from GoDaddy to Blogger. Both have been a pain in the you know what. And both have been a bit of a trip down memory lane. I was in the Phoenix house for 13 years, and have been doing the blog for 7 years. For both moves, I had to decide what to take, and what to not. Some things are good to let go, some things need to go, just make space, and make life easier. One thing that I am losing on the blog move are the comments. I do have them all backed up, but don't know how to put them back into the blog. But all of the recipe posts (along with travel and pottery related posts) are still here, and you can still link to them from the firecooked.com food page. At least I think that everything is linked... let me know if there is a broken link! Also... If you want to get emails when I do a new post (hopefully won't be another 6 months! ), you need to re-signup. We are getting good cucumbers at the farmers market now. Here is an easy salad that goes great with a summer dinner. note... I have been using garlic chives, since that's what I have in the garden. Whisk vinegar, water, sugar, dill, salt, and pepper in medium bowl until sugar is dissolved. 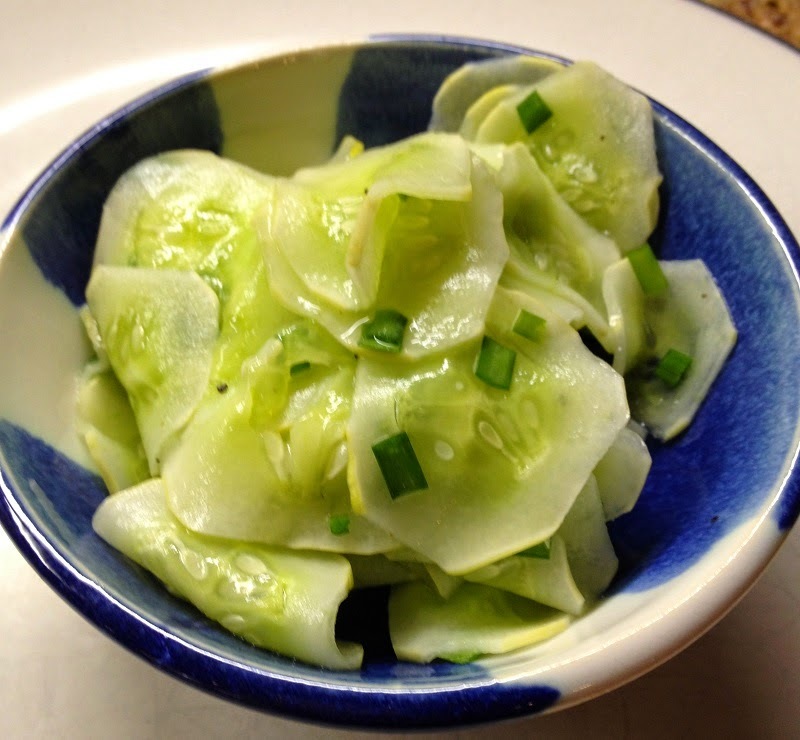 Add cucumbers; toss to coat. Refrigerate, covered, tossing occasionally, at least 4 hours (or 1 or 2 hours if you plan like me) before serving.